Nahi, Nathy or Crumnathy, surnamed Cruimthir (the priest) was an 6th century Irish saint of royal blood. He was born at Luighne, Sligo, Ireland around 529 AD and became a disciple of St Finnian of Clonard, who made him a bishop. He was founder-abbot of a monastery, which is questioned by some in view of his surname. Although Nahi probably never passed beyond the grade of priest, the cultus of Confessor-Pontiff with which the Church honours him is a very strong reason why he may have had the office of bishop conferred on him as a personal distinction because of his great learning or sanctity but he would have been left to his old duties as abbot, hermit or head of a school.His jurisdiction was probably not diocesan but his monastery was taken by the territorial bishop of Achonry (Co. Sligo) as the site for their cathedral. In his 'Lives of the Saints', Butler describes him thus: 'St Nathy Cruimthir, that is, "the priest" was a native of the Luighne district in Sligo and is mentioned in the life of St Attracta, who was probably his contemporary. He is said to have been put to Achonry by St Finnian of Clonard, though the name by which he was known makes it unlikely that he was a bishop…'. He moved East until he settled in what was then densely wooded countryside, overlooking a river where the Dundrum by-pass now follows. His monastery (later yielding a church dedicated to him) eventually gave rise to the name to the Parish of Taney (or Teach nDaithi or Nahi). From his house “Nahi’s House” or ”Teach Nahi” the words evolved to “Teaa Nay” and eventually the name of the parish became known as “Taney”. Nahi died c610 AD and was buried in the precincts of the Monastery in Achonry over which the Cathedral was built. His feast day is on the 9th August. Saint Nahi has relatively few namings in Ireland. He is the Principal Patron of the Diocese of Achonry and Co-Titular of the Cathedral Church. Apart from a Holy well in Blackrock, Dublin, St Nahi’s, Taney is the only such dedication in East Ireland. 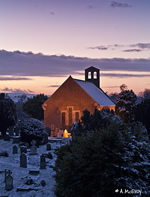 St Nahi’s (Anglican) Church, Taney, Dundrum, Dublin.